Makita is to power tools what Chiquita is to bananas. If that doesn’t make any sense to you, think of it this way: Makita and Chiquita are both names that indicate high quality in their respective fields. Makita makes power tools; Chiquita is probably the best known name in bananas. Ok, so neither of them have anything to do with each other, not really, but they just sound so much alike and they kind of roll off the tongue and are just fun to say. And if anyone ever tells you that you must always be absolutely serious when it comes to power tools or fruit, well, you can just tell them that you know the best names in both categories and let them stew on that for a while. Stew… that sounds good, is it dinner time yet? I seem to be a bit distracted, but what I’m really trying to do is distract myself from this insane fascination I’ve developed for impact drivers. I know it sounds a bit strange, but I’ve been coming to an understanding as to just how great these particular tools are and how much they can do, which has resulted in a great desire to look at every single one made so I can find out how they feel, how much power they have, and what makes each one of them different. Now, of course I can’t travel all over creation to touch every type of impact driver on the market, but I can do some research into some of the best, which is why we’re here. Makita is one of the best known names in power tools and their XDT08Z LXT Impact Driver is one I absolutely had to do some digging into because how complete can a review of great impact drivers be if it doesn’t include one by Makita? So let’s get to it. First of all, the motor on the XDT08 is a BL brushless motor and being brushless means it has no internal carbon brushes, allowing the motor to run at a cooler temperature and more efficiently, which results in a longer motor life. Brushless motors aren’t new, as they were used in manufacturing and industrial motors as far back as the 1960s, but they were first used in power tools in 2003 by guess who – Makita. That’s right, Makita was the first to put brushless motors into power tools, which were used in some very specific industries, but in 2009 they were also the first to put brushless motors into power tools made for consumers. Because of the technology used in brushless motors, they are more expensive than brushed motors and hence, the tools they come in are also more expensive, but if you need higher quality power tools on a regular basis, or you just want the best of the best, brushless motors are the way to go. I’m not going to get into the mechanics of how brushless motors are manufactured, but I think it is kind of nice to know something about what makes them so much better than brushed motors. Many companies call tools with brushless motors “smart” tools, and in some ways, they really are smart. Inside the motor is a tiny computer that senses how much resistance there is in the material the tool is being used on, and it adjusts the amount of power it pulls from the battery so it only takes what it needs. For example, screwing fasteners into elm, which is a soft wood, takes less power than screwing fasteners into black oak, which is a hard wood, and screwing into concrete or steel will take more power than what’s needed for the oak. Being able to automatically adjust the torque and RPM needed for a job can result in the charge on the battery lasting up to 50% longer. On the other hand are brushed motors, which run as fast as they can no matter how much resistance they are dealing with, so they use up as much battery power as they can as quickly as they can. That’s a very basic explanation of the differences between the two types of motors, and there is more to the story if you want to do some research yourself, but at least you have the general idea. 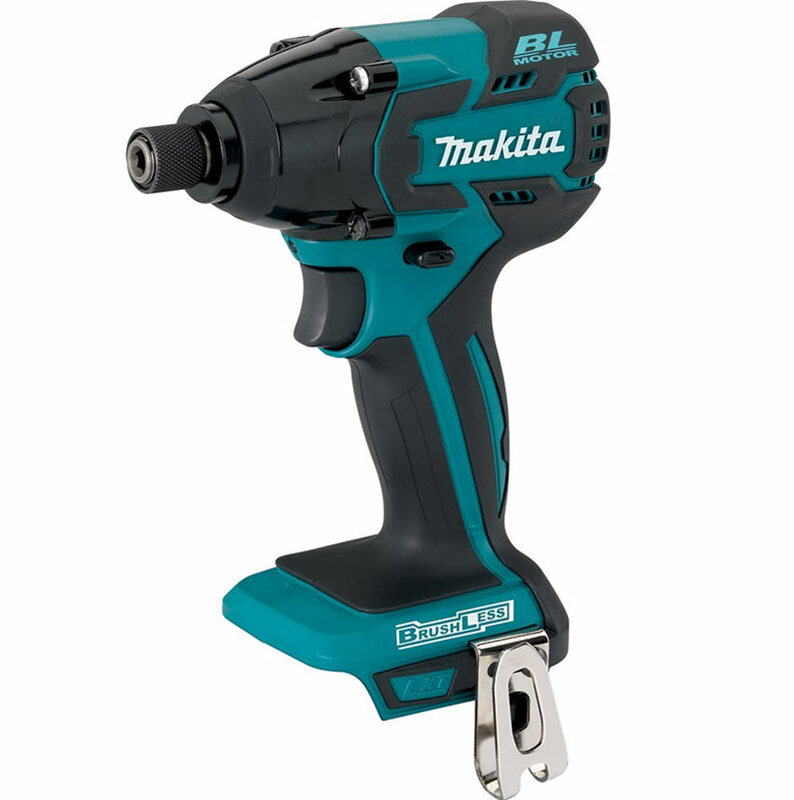 Tools that use 18 volt batteries are, of course, going to have more power than those with lower voltage batteries; tools with brushless motors are going to have more power than those with motors containing brushes; and tools with Makita’s impact mechanism are going to have even more. You see, Makita utilizes their own hammer and anvil impact mechanism, which no one else uses. Its components are made from the best raw materials and highest quality steel, and manufactured using Makita’s unique heat hardening process. What you end up with is an impact driver that provides up to 1,420 inch pounds of torque with up to 2,500 RPM and 3,200 impacts per minute. That’s some serious power! And we can’t forget that the XDT08Z is part of the world’s largest line-up of 18 volt power tools which use Makita’s LXT Lithium-ion batteries, interchangeably. Just like every tool I’ve reviewed so far, the XDT08Z does have an LED worklight. It appears that the worklight on older models stayed on for a short time after the motor was turned off, so the work area would stay lit up for a short time. With this one, the light turns off immediately when you release the trigger, which some customers have found to be less than satisfactory. However, some of the more adventurous users experimented a bit and found that there is a certain amount of pressure you can put on the trigger which will illuminate the light without engaging the motor. It might be a little tricky to hit it right every time, but there is a light at the end of the tunnel. Once again, I ended up choosing an extremely high quality tool to review and it did not disappoint. The Makita XDT08 has some great features: the brushless motor, Star Protection Computer Controls to keep the battery and tool from getting too hot and burning out, an ergonomically designed grip and almost perfect balancing, awesome torque and power, and it’s only 5 7/8″ long. The only thing you absolutely must keep in mind is that the XDT08Z is sold as a bare tool, which means it does not come with a battery or a battery charger. The upside to this is that if you have any one of the 70 or more tools in Makita’s 18 volt line-up, the XDT08Z will use the same battery so you don’t have to buy batteries you don’t need. This impact driver is a bit more expensive than some of the others I’ve reviewed, but it’s definitely one to keep an eye on.